The installation Zahra continues Younes Rahmoun’s investigations into the flower motif. 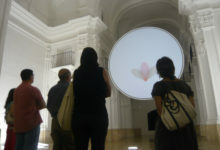 Here, seventy-seven flowers, which the artist originally created as drawings that were then used in an animated film, are printed on illuminated circular crates, divided into two groups placed on the black floor of an unused church in Murcia. The groups are equal with each comprised of thirty-eight flowers placed so as to make a conical form, as part of the artist’s research into what he calls “modest forms.” An isolated flower appears at the room’s center towards which point the tops of two pyramidal forms that are composed of the other seventy-six flowers. The first of seventy-seven, this flower is the first that Younes Rahmoun drew. The entire work evokes the aesthetic of stained-glass windows.